This week Colony finished its second season. This season changed things for all the characters and we got to see more of the world than just Los Angeles. While the mysterious Hosts are still rarely seen we find out a little more about them and their presence is felt even more this season. Will Bowman found his son Charlie in the Santa Monica Bloc and the return trip gave us the first sign that Will is somehow special to the alien Hosts. We find out in the penultimate episode of the season that Broussard is also special. Like Will, he was targeted by a drone but not fired upon. Bram Bowman’s experience in a labor camp led him to the first steps of becoming radicalized by an extremist humanist terrorist group. Bram does kill an official of the Authority (Katie Bowman, much like Lori Grimes, still can’t keep track of her kids) but the experience seems to have affected him and he is back in the family fold for now. Snyder was also at that labor camp, but he was in the administrator. Sure, it was a step or two down from being Proxy of the Los Angeles Bloc but at least he was alive and still a step up from being a college textbook purchasing manager (the season premiere revealed that he was lying about the provost at Stanford).. Despite the problems caused by Bram and his fellow resisting laborers, Snyder gets back the LA Bloc and becomes the behind-the-scenes operative for the Governor General of the Los Angeles Colony. Katie’s sister Maddie has had a rough journey this season. She started out as the girlfriend of the Proxy’s Chief of Staff. But thanks to Katie she fell under suspicion of being part of the resistance and later thrown out of the Green Zone (without her son) to fend for herself. She drank the Kool-Aid and became a true believer in the Greatest Day religion that the Hosts are pushing until Snyder later tells her it’s all crap. This season was rough on secondary characters and most of them are dead or shipped off to the Factory over the course of the season. As we roll into the finale, the Hosts have had it with the antics going on in the LA Bloc. The good news is that they aren’t going to just nuke the place from orbit. The bad news is that instead they’re going to send everyone to the Factory, their lunar labor camp. Maddie is at rock bottom. She’s been rounded up and sent to an evacuation center set up under the official cover story that the people of the LA Bloc are being relocated to the San Fernando Bloc. Broussard, bummed out after the death of the last member of his resistance cell, decides to stay in the Bloc. Will and Katie grab the kids and try to escape the Bloc. They also have the gauntlet (a bit of alien technology) that they plan to get to a resistance group outside the Bloc. The Bowmans get some unexpected help from Snyder of all people. With his help they get through the checkpoints and out of the Bloc. But Snyder activates something, most likely a tracking device, since he was talking earlier to a sinister Authority type about getting the gauntlet back (the loss of the gauntlet and subsequent fruitless search is a big reason the aliens are pissed at the LA Bloc). So the season ends on a grim note. Maddie is looking up as the aliens’ ships hover overhead. Broussard is in hiding in the LA Bloc. The Bowmans are outside the Bloc but are about to run into whatever Snyder’s sudden but inevitable betrayal triggered. Colony is at its best when it focuses on the people living under occupation. Will has no love for the alien Hosts but worked for the Authority to help and protect his family. Like many who collaborate he believes the Hosts can’t be defeated so he is trying to be pragmatic. His pragmatism versus Katie’s idealism was a major conflict of the first season. Will has come around more to Katie’s point of view this season as he sees the changes in Homeland Security after his return from Santa Monica. Karen, the leader of the Red Hand, is more interested in killing collaborators than driving the Hosts off Earth. Her philosophy is simply “you collaborate, you die.” Make no mistake - the Red Hand is an extremist group. They kill more humans than aliens. Families of collaborators are fair game whether they have anything to do with the Authority or not. The Bowman’s nanny was gunned down when the Red Hand went after Will. They certainly would have have killed her anyway if they had known she was a government minder but the point is that they killed her immediately simply because she was in the house. The Red Hand killed members of other resistance groups because they weren’t fanatical enough. If it sounds like I’m equating the Red Hand with ISIS that’s because I am. Poor Jennifer McMahon can’t deal with what Homeland Security has become with its pervasive surveillance program. She decides she can’t live with being the kind of person she would have to be to succeed in the new order. We last see her popping pills and drinking wine. This is obviously a suicide attempt but it’s never confirmed that McMahon is dead, just that she’s gone (if someone doesn’t die onscreen, they’re not necessarily dead). But I do have concerns about what the show will do with the Hosts. The two big questions of alien invasion shows and movies are why are they here and how do we beat them. Those questions were well in the background during the first season but this season started addressing them. The Hosts have been watching Earth since at least the Apollo Moon missions. They are snatching certain humans. Will Bowman and Broussard are apparently on the list of people the Hosts are interested in. I have no idea if this lead to a plausible reason for the aliens to go through so much trouble to invade Earth. I’m even more skeptical about seeing how humans defeat the aliens. I don’t think the show will get into Falling Skies level of ridiculousness but I’m not sure how plausible it will be. The solution will probably be tied into why the aliens are here in the first place. We do know that one of the Hosts has turned traitor and is working with a resistance group outside the Bloc and that the Hosts have internal factions, at the very least moderates and hardliners with regard to dealing with the humans. 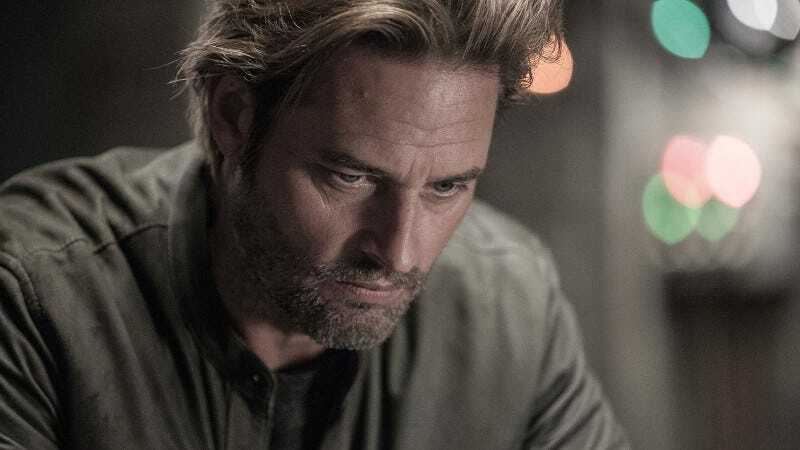 Colony has been renewed for a third season so we’ll almost certainly get some answers about the Hosts. But the main thing the show needs to remember is that it’s more about the humans than the aliens.